Spaghetti, as everyone knows, is Italian cuisine. The word spaghetti itself is Italian for little strings. Yet for an import, it’s pretty ubiquitous outside of Italy. All over Europe and the Americas, spaghetti is one of the most popular dishes. Many of us grew up with it, whether or not we have any Italian ancestry. All the same, it still registers as a foreign dish. With all the Italian immigrants to the United States, it’s hardly surprising that this simple yet versatile dish caught on here, but it still had to be new at one point. Exactly when spaghetti stopped being an outsider food and started ranking as comfort food for Americans is hard to pin down. It probably started around the time we stopped seeing Italians as outsiders who were threatening our way of life. The Immigrant Exclusion Act of 1924, which effectively stopped (legal) Italian immigration to the United States, was just a symptom of a rising anti-foreigner sentiment. The trumped-up charges against Nicola Sacco and Bartolomeo Vanzetti, anarchists sentenced to death for two murders committed in Braintree, Massachusetts in 1920, led to their executions in 1927, causing much public outcry over the dubious charges and the anti-ethnic bigotry that many saw behind them. 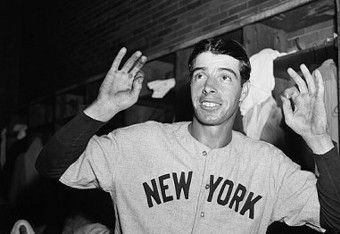 Joe DiMaggio in 1941: does a guy like that eat spaghetti? By the 1950s, spaghetti had gained much more acceptance in middle America, but in Great Britain, it was just catching on. For all of World War II and for nine years after, food was rationed in Britain. The difficulty of getting even the basic staples took its toll on British cuisine, and is probably responsible for its undeserved reputation as bland, overcooked and unpalatable. When rationing was lifted in 1954, Britons had much easier access to bacon and bread and vegetables, but pasta was beginning to make its way onto the British plate. This exciting, foreign food had crossed the Channel, and the nation started to warm to it. This new and interesting food, so outside the British experience at the time, left many people wondering what it was, while even more probably didn’t even investigate the matter that far. That’s why the British current-affairs television program Panorama decided to look into it. Sort of. Panorama ran a three-minute segment narrated on the annual spaghetti harvest in the small town of Ticino, Switzerland, where a family of Swiss Italian spaghetti farmers gathered strands of spaghetti ripe for picking from their grove of spaghetti trees. The segment ran on April 1, 1957, and is thought to be one of the first (if not the first) April Fool’s jokes played on television. The segment was narrated by distinguished news presenter Richard Dimbleby, lending the joke an air of gravitas that helped it to come off so successfully. The distinguished Richard Dimbleby, of whom a colleague said he “had enough gravitas to float an aircraft carrier”. The segment was shot on location in March of that year. It was the brainchild of Austrian-born cameraman Charles de Jaeger, who worked for Panorama and had had the idea of the spaghetti harvest on his mind for years. He claimed the idea came to him from a teacher he had in school who would chide them, “You boys are so stupid, you probably think spaghetti grows on trees.” De Jaeger, who had a reputation for loving a good practical joke, had been trying to get his spaghetti tree hoax made for years before Panorama decided to give him a chance. The logistics were something of a challenge. While he had no trouble finding Italian Swiss locals to take part, the dry strands of uncooked spaghetti kept falling off the trees. Cooking the spaghetti first only made it too slippery to stay in place. Eventually his team hit upon the idea of wrapping uncooked spaghetti in damp cloths, which made it pliable enough to hang from trees without slipping. The joke segment ran without warning, and caused quite an uproar. The BBC, Panorama’s parent company, was flooded with telephone calls from viewers within minutes of the broadcast’s end. Some wanted to know how to get a spaghetti tree of their own. There were others who were quite aware that spaghetti does not grow on trees, and who felt that this joke was quite inappropriate for a serious news program like Panorama. Others appreciated the joke, including one caller who protested that spaghetti did not grow vertically from trees but rather it grew horizontally. Before the end of that day’s broadcasting, the BBC issued a statement explaining that it had all been a joke, and that there was never any malicious intent at all. It’s that time of year again! There’s nothing like fresh, home-grown spaghetti! 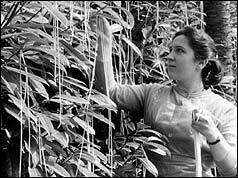 Spaghetti, still an exotic food to Britain, was shrouded in mystery. One such person was Sir Ian Jacob, the Director-General of the BBC. A couple days after the broadcast, Jacob encountered Leonard Miall, who was in charge of production of the Panorama program, and said to him, “When I saw that item, I said to my wife, ‘I don’t think spaghetti grows on trees,’ so we looked it up in Encyclopaedia Britannica. Do you know, Miall, Encyclopaedia Britannica doesn’t even mention spaghetti.” (Later editions have no doubt corrected the omission.) Jacob, despite having been taken in by the joke, was a big fan of it, and spoke in glowing terms of its being well done, expressing gratitude for the team that put it together. The segment was famous outside of Britain, as well. It was aired in America by Jack Paar and later by Johnny Carson, and they received their share of irate letters from viewers upset by what they saw as a mockery of simple farmers. The anger was so great that after a week, Carson felt the need to stand on stage with a box of spaghetti and read off a list of ingredients in reply. Just to make sure you’re not fooled: spaghetti is made with flour and water. But if you do try growing your own, please keep me posted about the results. I’d be most interested to know how your crop turns out. The original Panorama segment as it originally aired.